"Man is the only animal that blushes . . . or needs to." By this I do not mean to say that earthquakes and hurricanes wreak havoc on the earth, or that Black Widow Spider females sometimes consume their mates after mating. These and many other examples might be considered evil (physical or natural evils), but they are not moral in character. Moral evil is found only in intelligent beings; it deprives them of some moral good. . . This may be defined as a privation of conformity to right reason and to the law of God. Since the morality of a human act consists in its agreement or non-agreement with right reason and the eternal law, an act is good or evil in the moral order according as it involves this agreement or non-agreement. When the intelligent creature, knowing God and His law, deliberately refuses to obey, moral evil results. Granted that many human acts resulting in harm are often done out of ignorance, the fact remains that everyone, at some time, intentionally and knowingly acts in a way that we know to be wrong. When we do so, we sin, harming ourselves, others and the creation. We also damage our relationship with God. I need not spend more time going into the reality of moral evil. If one doesn't believe it exists, then there's nothing I can say to convince them. The question that concerns us, here, is why there should be moral evil in the first place? If our first parents lived in a state of original justice and innocence, awake to God's presence in their own being and throughout creation, then why should they have ever acted in a manner contrary to the requirements of that beautiful state of being in the first place? We know that must have happened, for here we are, their descendants, living in a world where moral evils of all kinds take place with such frequency that we have become numbed to the news of them. We see how it is that non-love in our families and relationships wounds us in many ways, and when we attempt to get at the root of where it all started, we end up with the first parents, who somehow gave birth to the dysfunctional family system we call the human race. Tradition tells us that our first parents damaged their relationship with God by disobeying a law given them by God (Gen. 3). You know the story: they were not to eat the fruit of the tree of knowledge, but were tempted to do so by the serpent, after which, their eyes were opened and they were ashamed of their nakedness. What does this all mean? And what does it say about God, that such terrible consequences would ensue because they committed what seems to be such a small indiscretion? Well . . . terrible consequences, yes; but small indiscretion, no! Notice that what was at stake in the temptation was the invitation to usurp God's place in determining what was good and evil. As the serpent put it, "you shall be as gods." This reversed the lawful order established by the Creator, who had deemed some things good and others "off-limits," as it were, to these first humans. We do not know what, specifically, that might have been, but the first two chapters of Genesis show the Creator telling them what foods are right for them to eat, and providing other guidance. What's suggested, here, is that these new creatures were treated as more than animals relying on instinct and primitive culture. In fact, there was no culture to teach them what it meant to be human, so it's possible that God (through the mediation of angels, perhaps) gave direction to their intelligence and freedom that would enable them to maintain the joyful harmony they experienced -- what to do, and what to avoid, etc., in a manner similar to what parents do with their children while growing up. Their humanoid parents taught them how to survive, but God taught them how to live in the realm of spirit. . . or at least tried to do so. At some point, they took matters into their own hands, and a serious matter it must have been. A strong tradition relates it to sexual activity -- that they had relations with each other before the time was right that they should bring offspring into this world. We don't know if that's the case, of course, but whatever happened, the consequence was the forfeiture of paradise and the rupturing of their relationship with God. Interestingly, Thomas Aquinas speculates what might have happened had the first parents not sinned. He speaks of the human race continuing through the offspring of the first parents, with these children enjoying the same blessedness as their parents. He also conjectures, however, that they, too, would be subjected to some kind of testing, and that they might have fallen. Thus the possibility remains that human nature could have been damaged even after the generation of the first parents, but in such a case, the wound would not have been so deep nor would it have produced such dire consequences for subsequent generations. So what happened to human nature as a consequence of the Fall? Did it become corrupt like the spirits of the fallen angels, whose rejection of God was total and complete, consigning them to the hell of everlasting separation? In response to this question, Catholics and some Protestant traditions are in disagreement. Protestants following Calvin, for example, maintain that with the Fall, human nature itself became metaphysically corrupt and incapable of truly advancing in the ways of goodness and truth. This was a radical break with Catholicism's view that the Fall signified a damaged relationship with God that deeply wounded a human nature that was still inherently good. Indeed, the Catholic Church affirms that reason is still capable of discerning God's truth, and the will can still respond to grace (two points which enable Catholics to affirm the good accomplished in non-Christian religions). Nevertheless, the wound resulting from the Fall brought deep and painful consequences to all levels of our humanity, including the body, which lost its hold on immortality, becoming subject to sickness and death. It is also the Catholic view that one cannot completely restore the original harmony through the exercise of natural reason and freedom, for it penetrates to unconscious depths far beyond the domain of these conscious faculties. Another consideration, here, is that the Fall made human beings more vulnerable to the influence of fallen angels and other evil spirits (eventually, including evil human souls). Note that the key word, here, is vulnerable, rather than controlled. 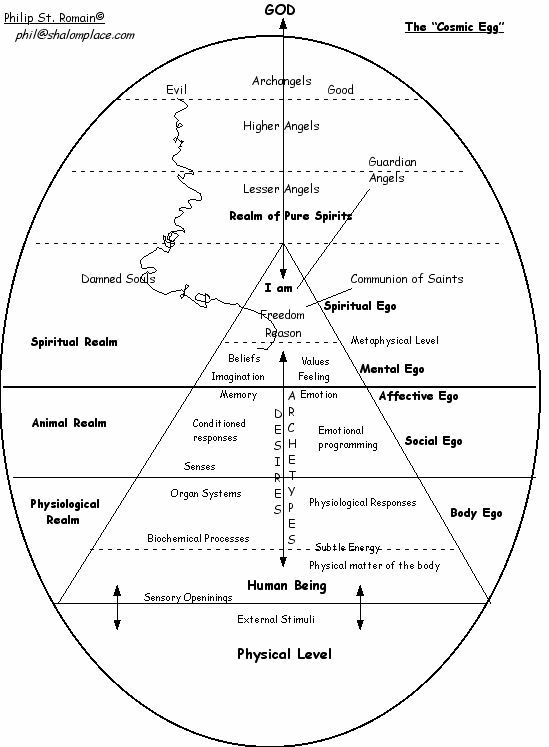 The "Cosmic Egg" image (http://shalomplace.com/books/Universe.jpeg) shows this, as does the more graphic series portraying human nature, the temptation and the Fall in slides 4-7 of my Christian Mysteries series (http://shalomplace.com/inetmin/mysteries/index.html). After the Fall, the influence of evil spirit resonated deep within human nature, producing something of a "static" that overshadowed the sweetness of life that hat predominated before. Still, this does not constitute human nature as intrinsically evil -- only vulnerable. Recall from our previous session that all human beings possess a human nature, which is essentially spiritual and which informs and energizes the other levels of our being (animal/biological and vegetable/physiological). The first parents were the only two who possessed this new level of creation, and so the rupturing of their relationship with God damaged human nature itself. The vulnerability to evil spirit and the consequences of shame and anxiety resulting from their loss of intimacy with God became the inheritance of their children and all who are descended from them. Within a few paragraphs following the account of the Fall, Genesis relates the story of Cain and Able, a sibling rivalry that brought about the first murder. And so it continued that evil spread throughout the human race, becoming enculturated in the process through traditions of injustice and oppression. All this because of the sin of our first parents! When we speak of Original Sin, then, what we mean is the damaged human nature that we have inherited from our first parents. We speak of it as sin because it "misses the mark" -- it is not what God intended for us to inherit; also, it predisposes us to selfishness and personal sin in many ways. We do not mean to say, however, that individual humans are bad, evil, etc. Following the Catholic view, human nature is still considered good -- an original blessing, if you will, following the terminology of Matthew Fox. Individual humans are to be considered good as well, and our lives are a marvelous gift from God. Nevertheless, it would be naive and dishonest to not also acknowledge the reality of broken, wounded human nature and our enormous capacities for self-deception and evil. The doctrine of Original Sin is an attempt to give an accounting for these realities, and I think it does so very well. "But how can it be," some have inquired, "that we are born into such a condition?" "Is not the soul a new, special creation of God?" They can see how it is that we are wounded by families and cultures of non-love, but not at the level of being. And these are good questions, of course. Perhaps some of you have had the same. The response we keep coming back to is that human nature is not simply a private possession, but a corporate one as well. The spiritual soul we are given by God constitutes us as an individual and enables our bodies and all aspects of our being to develop into a human rather than, say, a higher ape (with whom we share a very similar genetic profile). But the soul also makes us members of the human race and joins us in the depths of our being to other souls who also possess a human nature. The individual human soul we receive from God is perfect in every way, as what God creates can only be good. But the larger human race we belong to has been damaged by the Fall, bringing disorder to our individual soul as well (sort of like a virus in a computer operating system damages the software that runs on it). The primary consequence of the Fall is the loss of "Original Justice," which established our first parents in a right relationship with God and enabled them to direct their lives according to the exercise of reason. After the Fall, a lack of balance ensued, especially between our more sensible appetites and the exercise of reason, so that it became increasingly difficult to govern one's life through the exercise of reason. As we see in the dialogue between Adam and Eve when they are confronted by God for eating of the forbidden fruit, they use their powers of language and reason dishonestly, further distorting their nature. The man blames the woman, who blames the serpent, and neither has the decency to apologize to God nor to ask for forgiveness (that was to happen later by another Man on a cross). Furthermore, the man begins to lord his strength over the woman, who uses her sexuality to manipulate the man. Dishonesty, deceit and manipulation becomes commonplace, as humans develop a system of conditioning we today call the "false self," which goes about pronouncing good and evil according to its own biased standards. Such is the sorry state of human affairs which, happily, is not the end of the story. Jim Arraj's masterful essay on Original Sin reviews the theological discussions that have taken place during the past century while reaffirming the traditional doctrine. The 1910 Catholic Encyclopedia is online, and has a good presentation of the traditional doctrine. Wikipedia Encyclopedia reviews some of the current discussions while presenting how it is understood in different religions. 1. What questions or comments do you have from this presentation? 2. How has your understanding of the Fall been reaffirmed and/or challenged by this presentation? 3. How do you experience "Original Sin" in your own life? I think my greatest concern is that we will be drawn into the metaphor and get stuck there. which is hopeful, but the closed and traditional views of many institutional religions have stolen the joy of the garden of life from many. There has been profound sin committed in the name of churches and in many of its agents as there ever was in the first garden. I know we are examining the roots of it. Yet, it feels important to present it with a glimpse toward it transformation. that the good and the evil, the pain and the joy, the darkness and the light, the misuse of life and the embracing of it, are all polarities of the same gift. When we experience darkness, the light can become almost a celestial brilliance when it returns. When clouds move across the face of the moon, it is ever more beautiful when the clouds move beyond it. When we experience any kind of pain, physical, psychic, emotional, mental, spiritual pain, we feel a liberation and a freedom in its passing. When we stumble and do something harmful to ourselves or someone else, we feel the flaming sword blocking us from life, and we feel the restriction and contraction of life within ourselves. When we love someone, and we seek their well being as fully as our own, we feel the fresh air of life again. When we are lost, we are at a standstill. When we find our direction, it is in surrender to the movement toward God, which is where Jesus leads us. I know that is coming, but I always set up a vision in the presence of the grey discussions of any kind of evil. How else do we keep our hope? You notice it stopped discussion. Naomi, there wasn't much discussion of the thread on "levels of creation," for whatever reason, so we'll see what happens. But I grant you that this is not an easy nor a fun topic to discuss. That's the way we experience things all right. If, however, one affirms that God is pure goodness, love, etc. and that God's creation is inherently good, then it doesn't work to say that evil, pain, darkness and the misuse of life are somehow intrinsic to the creation as a polarity. Where that ends up, metaphysically, is with the old theodicy conundrum wherein God's goodness and power are brought into question. I think the way we understand God and creation, and the way we account for moral evil has enormous implications for spiritual practice. Granted, there were abuses in the past in how the doctrine of Original Sin was presented, but the fact of moral evil remains and needs to be accounted for. Your affirmaion of the way that Jesus opens for us is right on the mark and anticipates session 6. My thought is that we can appreciate that all the more if we understand the situation among humans on planet Earth that God was dealing with. JB, I'm not sure the participants know the meaning of some of your terms -- e.g., semiotic, univocity, axiological, ontological, teleological, and a few others. Statements like The semiotic grammar folks are more sympathetic to the process approach and acuse the monists and dualists and hylomorphists of substantialism, essentialism, nominalism, a priorism, and point out many other fallacies presume a lot of your readership, here, that I don't think exists (I'm not even sure what that all means -- pretty sweeping generalization, whatever the case. ) I know these are helpful shortcuts for engaging in depthful discussion on complicated issues, but we need to be able to understand what you're saying to engage in dialogue. God speaks a word of existence to human beings, endowing us with intelligence and freedom. The misuse of such by the first parents resulted in damage to our human nature, and this continues to affect us all. This is not really a very complicated message, imo. I also presented it in session #5, after developing a perspective on God and creation in the previous four sessions to provide a wider context. It's a coherent and internally congruent explanation, resonating with the facts of human experience and with Revelation. That doesn't mean there aren't better explanations given or to come, nor that the traditional one isn't ultimately an analogy or metaphor. So far as I'm aware, however, there hasn't been a better one given (at least in terms of considering Revelation and human experience). I'm still not sure why/how one should get stuck in the metaphor, especially given the continuing affirmation of human nature as good and the knowledge that Christ has come. Those were notes to myself that I should have journaled elsewhere rather than here, unless and until I could make them more accessible. If I didn't have time for that chore, I also probably didn't have time to write an extra paragraph apologizing ahead of time for the faux pas and seeking forbearance I misused your forum (maybe out of long habit ) as my journal, convenient as it is! Mea culpa, and maybe it'll be a felix type! JB, it's always intriguing to get a taste of how the dialogue on these kinds of topics goes among those with high-level proficiency in philosophy, so thanks for that. If you can reassure me that I'm not guilty of substantialism, essentialism, nominalism, and a priorism, we'll just forget the whole thing and move on. Phil, My reaction is emotional. I acknowledge that. I work with so many people who are emotionally depressed and constricted with little access to the transforming energy of love,it makes me want to fast forward to the good news. Yes, I know how it comes out, but there are times that I don't want to yield even for the sake of discussion to a time without Jesus. Yet, I know that any discussion of fallen human nature must include moral evil. I have to confront it in myself and in others like anyone. I humbly yield to you theologians to bring the light to this subject. A pretty neat resource, though not very indepth, is The Ism Book, which is in the public domain. It can help anyone really interested in doing metaphysics. That would be one way of delving deeper into same because, often, the suffix -ism, is added to metaphysical or philosophical terminology to describe a competitor's ideas with pejorative force. I have found that it is the clash of ideas in the open marketplace that has best instructed me (even while the clash of personalities presenting those ideas has most disillusioned me). One can get a deeper understanding of one's own position by deeply engaging another's, or by, sometimes, using it as a foil to illustrate one's points and counterpoints. So, what I am talking about involves issues of both style and content, form and substance (to be aristotelian ). There are several dynamics I have seen over the years re: philosophy and metaphysics. One is how adherents of different schools of thought get so riled up, use so much perjorative force and get so defensive when interacting with their competing ideas. Another is how so many folks outright dismiss metaphysics as a silly parlour game, at best, as downright dangerous, at its worst. But let me address the first issue. An online magazine I really enjoy, is First Things, and its contributors are first class. In this article, Original Sin: A Disputation, one can get exposed to many of the same substantive issues Phil has discussed, as well as those presented in more depth at the link to Jim Arraj's thoughts. So, I'm going to use it as an example to illustrate an approach to, let me call it, scholarly civility, or maybe, the art, or even etiquette, of disputation. That it has to do with the idea of original sin is incidental in that regard, a bonus, so to speak. In this situation of widespread denial, perplexity, or negligence [regarding original sin], I thought the best defense of the doctrine could be mounted if it were presented as a typical article in Thomas Aquinas’ monumental Summa Theologiae. In this work Thomas would begin each treatment of a so-called "disputed question" with a fair-minded exposition of the position he wanted to refute in the latter half of the article. This is the famous Videtur quod section of the argument, which is usually translated as: "It would seem that [such-and-such a doctrine] is not the case." An unsuspecting reader, rather stunned and confused, may read whole pages containing nothing but opposing arguments formulated in a highly convincing manner. There will be nothing at all in the phraseology to indicate that Thomas rejects these arguments—not the trace of a hint at the weakness of the argument, not the slightest nuance of ironical exaggeration. The opponent himself speaks, and an opponent who is obviously in splendid form, calm, objective, moderate. . . . In this procedure there emerges an element profoundly characteristic of St. Thomas’ intellectual style: the spirit of the disputatio, of disciplined opposition; the spirit of genuine discussion which remains a dialogue even while it is a dispute. So, in this Videtur quod section of any argument, translated as: "It would seem that [such-and-such a doctrine] is not the case," what we really have is someone acknowledging up-front that one's position might seem paradoxical, counterintuitive, seemingly indefensible or what have ya. It is kind of like saying: "I can see why one might think that ..." and then going on to say why "I would think that, too, except for ..."
Aquinas was not only pretty smart. He was pretty cool. Naomi, I'm not meaning to discourage emotional or other reactions to the teaching I've presented, here. Goodness knows how many people have been beaten up by the doctrine of the Fall/Original Sin. What I hope comes through, however, is that it doesn't follow at all that the constitutes a rejection of the human race by God, nor the conclusion that human nature is somehow bad. It merely tries to account for the origin of moral evil and how it is that the whole human race is somehow wounded and weakened in its ability to live according to goodness and truth. Paul summarizes this quite well in Romans 7, in his reflections on how he loves God's will with his mind, but another force moves him to do the opposite. Other religions concur -- the Buddhists recognizing how selfish desire creates suffering, the Taoists how departing from the lawfulness of Tao makes us crazy, and the Hindus on how we live so much of our lives caught up in narrow illusions. The Judeo-Christian tradition has its own "take" on this matter, and if we understand it properly, we are much better of for it, I believe. Right. Same here. Numerous times each day. JB, I just wrote a rather detailed response to some of your questions, but it didn't post. There's no time for a repeat now; maybe it'll come out in the digest and I'll re-post it. If not, later . . . The use of the term fields has the markings of some sympathy for the more dynamic, process approaches. Some actually combine their approaches and call them substance-process. Some argue that retaining the aristotelian concepts is unnecessary metaphysical baggage and move to pure process, employing metaphors of experience, for example, see Whitehead. the doctrine that there is no objective meaning to the words we use — words and concepts don't pick out any actual objects or universal aspects of reality, they are simply conventional symbols or names that we happen to use for our own convenience. This flies too much in the face of our common sensical experience of reality, for instance, such an experience as communicating with one another as distinct, however social, entities. Reality becomes one unitary organism and our autonomous existence gets lost. The reality of the process of experience is overemphasized while the actual content is ignored. Nominalism creeps in especially in those process approaches that employ the dipolar concepts of reality we mentioned earlier. Without very high nuance, what some folks intend as panentheism becomes indistinguishable, for all practical purposes, from pantheism. Following Charles S. Peirce, Gelpi proposes as a much more adequate model a triadic notion of experience. In this construct there are three "irreducible variables": evaluations, which correspond to possibilities (Peirce's "firstness"); actions, which correspond to facts, to concreteness (Peirce's "secondness"); and tendencies, which correspond to habits or generalities, but not to universal essences (Peirce's "thirdness). In his book, Gelpi critiques several key theological movements on the basis of their faulty concepts of experience and the flaws these induce, and demonstrates how this triadic account provides the remedy. The book is divided into three major parts. The first part focuses on the fallacies that Gelpi is concerned to avoid: essentialism, dualism, nominalism, rationalism, and the extremes of optimism and pessimism. He finds these fallacies in the work of theologically influential thinkers of the past, including Plato, the Stoics, Aristotle, the Gnostics, the Jewish apocalyptics, Augustine, Aquinas, the Reformation theologians, Kant, Whitehead, and Schillebeeckx. At the root of all these fallacies is a priorism, which is unable to distinguish the formulation of an hypothesis from its verification. Gelpi proposes the relational, triadic, and social metaphysics of Charles Sanders Peirce as a way to escape this a priorism. That is all well and good but to the extent that our apophatic descriptions of what God is not begin to so distance the reality of God from creaturely reality, invoking the weakest of analogies in metaphorical language, there is a question left begging as to how a reality so dislike another reality in both form and substance (per the aristotelian-thomistic framework) can be causally linked or have any efficacious effect on same. The chain of causation is effectively broken; physical causal closure is violated or becomes unintelligible; our stipulations of God being some primal cause that really can have an effect even if we cannot say how based on classical notions of causality become mere tautologies; the conclusions that flow from them are necessary only by virtue of an a priori definition, which has a logical form but no empirical basis. So, there is much appeal for the semiotic approach insofar as it prescinds from the substance and process approaches and thus eludes their inescapable fallacies, such as causal disjunction, which I just discussed re: the former, such as the nominalism, which I discussed re: the latter. This approach avoids those fallacies by avoiding the conceptualizations employed in those metaphors. It resonates somewhat with what we might call nonenergetic causation of formal realities (the causal disjunction, violation of physical causal closure conundrum) by investing efficient causality of a sort in the objective reality of our concepts, thus avoiding nominalism. Ideas, neither physical nor nonphysical, are efficacious and clearly exhibit causation, as possibilities mediated by probabilities become actualities in terms of signs, symbols, syntax, semantics --- all which captures both meaning (content) and process. This is just a heuristic device, a grammar, to describe reality without claiming any a priori knowledge or exhaustive explanatory adequacy. In this way, it is sort of phenomenological, which is to say it sets forth patterns of what appears to be going on without necessarily grounding how those patterns come about or where all of these habits and probabilities we see reality exhibiting originate. This approach has great utility in quantum physics. The following is kind of dense, but in Benedict M. Ashley, O. P's review of Deely's 4 Ages of Understanding, perhaps one can sense this mutually occlusive, unintelligible dichotomy that substance and process metaphysics encounter in one another. Either we get the kantian, nominalist perspective that what we call causes are mental projections and the humean notion that causes are not empirically knowable or we get the inescapable dead-ends of thomism as all metaphysics is reduced to esse (being) and gets tangled in tautological obfuscation with the application of analogy to causation. In semiotics, some signs are mind-dependent and others mind-independent, indisputably so, and so we enjoy a distinction between what we might call the physical reality of actualities and the objective reality of ideas without worrying about the realism-idealism debate of the essentialists and nominalists. What Peirce saw clearly, and Poinsot had in Scholastic terms anticipated, was the triadic relational nature of the sign. A sign is not simply something by mediation of which something else is known, a dyadic relation of sign and signified, but a triadic relation between first an object known A (the sign), another object known through the first object (the terminating object) C, and what Peirce called the "interpretant," that is, a third object of knowledge that is precisely the relation of signification between the first two objects, B. For example, a scientist observes that heavy objects fall (A) and infers that they have the property of gravity (C), because he understands this in terms of what in his scientific perspective he knows to be the logical relation of cause to effect (B). This critical or scientific understanding is possible only if the scientist does not confuse the logical relation of inference from effect to cause (which is purely mind-dependent) with the real dependence of effect on cause. If he does not make this distinction he falls either into Hume's empiricist notion that we do not know causal relations or Kant's idealist notion that this relation is a merely mental projection. One has only to look at current quantum theory to see into what puzzles such confusions have plunged modern science. As the Nobel Laureate in Physics Richard Feynman is often quoted as saying, "I think that I can safely say that nobody understands quantum mechanics." So, I do not see the semiotic approach as a replacement for ontological approaches (substance and process) but only as a way to back up and review waht it is we are doing when we claim to be doing physics or metaphysics. Metaphysics has usually followed a very primitive kind of quest. You know how men have always hankered after unlawful magic, and you know what a great part in magic words have always played. If you have his name, or the formula of incantation that binds him, you can control the spirit, genie, afrite, or whatever the power may be. Solomon knew the names of all the spirits, and having their names, he held them subject to his will. So the universe has always appeared to the natural mind as a kind of enigma, of which the key must be sought in the shape of some illuminating or power-bringing word or name. [The traditional rationalistic temperament is for fixed foundations:] That word names the universe's principle, and to possess it is after a fashion to possess the universe itself. 'God,' 'Matter,' 'Reason,' 'the Absolute,' 'Energy ,' are so many solving names. You can rest when you have them. You are at the end of your metaphysical quest. This is a type of pragmatism that does not suggest that, if something is useful, then it is true. It does suggest, however, that if something is true, one of its characteristics will be that it is also useful. So, we can employ usefulness as a criterion in our search for truth, which marches on inexorably, however fallibly. It is merely to ask: What difference will it make if this is true versus that? If there is no difference, pragmatism judges the argument as idle. This is also to say that, just because something is a tautology, it does not mean that it is not the case; it only means we have not added any new information by making our claim. Bottomline is that I have no problem with substance or process approaches, as long as they answer one another's legitimate critiques, as long as they both step back, which is to say, prescind from their metaphysical engagements to a critical phenomenological perspective, like the peircean semiotic grammar. Coming full circle back to original sin, we can prescind then from any notion of a felix culpa or of a wounded form to the root metaphor of a triadic, social relational experience to say that what it is --- is the effect of our finitude plus everyone else's (through all of time) personal sins on us and the effect of our personal sins and finitude on everyone/thing else. Now, whether it turns out that this effect is mediated by a wounded form, an ontological rupture located in the past, or by an unfinished creative process, a teleological chasm oriented toward closure in the future, the former a substance approach, the latter a process approach, or by both, phenomenologically speaking, we no this finitude and our personal sins make a difference and change reality, whatever our root metaphor may be. The doctrine of original sin is rooted in an issue of theodicy: why do we have all of these idealistic notions but never realize them? Where could they have come from in the first place? Why would God create us and then torture us for a nanosecond if SH/e is truth, beauty, goodness, love? Why do we not seem to be injured in knowing what is good to do but are profoundly injured in liking what it is that is good to do (to paraphrase someone re: original sin, like Pascal, but I forget really)? I locate the most significant aspect of any answer, not in locating the rupture between our essentialistic idealizations and their existential realizations but rather in our failure to carefully define, rigorously predicate and highly nuance the terms and definitions we use in our God-concepts. In other words, which concepts are employed with univocity, equivocity or analogically, kataphatically or apophatically? And does this or that element of our metanarrative communicate an historical vs allegorical (creedal) vs moral vs anagogical (orienting our hope) truth, metaphorically or literally? When we say God is good, we really mean: "You know what I mean when I say something is good or someone is good? Well, God is good, but not good in exactly the same way or by exactly the same means, but think of something like that and that is what He is. He is someting like that but in many more other ways, at the same time, She is totally and thoroughly and unambiguously UNLIKE that or anything else you have ever or will ever experience." And substitute truth, beauty and love for the word "good" above --- or even "being" or even "cause" and that is what a suitable defintion, rigorous predication and highly nuanced conceptualization of God entails. Our analogies make God intelligible and metaphysics a worthwhile endeavor, although many dispute the truth of natural theology. Nothing we will ever devise in the way of a metaphysic will make God, or even the whole of created reality, fully comprehensible. They are, rather, merely apprehensible. Disambiguate the terms employed in our metaphysics and -- voila --- our theodicy issues get framed up as an unfathomable mystery, part of the incomprehensible Mystery of God. We find it worthwhile to pursue their intelligibility, however. Thus we come up with such ideas as original sin. And these ideas compete with one another for intelligibility, congruence with our life experience and external reality, rationality, internal coherence, logical consistency, hypothetical consonance with the rest of our worldview, etc A lot of people have big problems with any idea of The Fall and I can understand why. I'm not even sure I'd bother too much, myself, with theories of original sin, because once we properly disambiguate the terms we employ for God vs creatures, perhaps we can rest a little and know that all may be well, all can be well, all will be well and we will know that all manner of things shall be well --- not because we have already eaten the whole banana (ahem, apple) but, rather, we have recived first fruits, an earnest, a down payment -- and we're willing to leverage it, unconditionally, in support of the notion that God cares (not like we care but different and way better) and the universe is ultimately friendly, even if no one can say how this could possibly be, given so many appearances to the contrary. It is good that the theologians bother with all of this though because what Charles Pierce called the cash-value of our ideas; for our theological anthropology does make a difference in how we respond to reality and one another. Still, that anthropology is only as good as our theology and God-talk is incredibly messy, ambiguous, unnuanced in most discussions. Anyway, what might one do differently if Haught and the process folks are right or if Arraj and the substance folks are right? OK, I've found the post I wrote earlier. Turns out I has hit "Edit" for one of yours. Oops! Refresh me: have we discussed the origin of natural evil yet? No, we haven't. I'm not sure the term "evil" is the right one, however, although that is how all sorts of phenomena have been described. But there is no evil in the way black holes, supernovae, tornados, hurricanes, earthquakes, volcanoes, etc. happen. It's not even evil that animals eat plants and each other, and that those who are eaten suffer for a brief time. This is all part of nature lawfully taking its course. To wish that things would be otherwise is to wish that God had created another kind of universe, and I don't really care for those kinds of discussions. The universe is what it is and it's good. As the encyclopedia quote in my opening post points out, only intelligent beings can create moral evil and so diminsih the good intended by God. So . . . for me, at least: no such thing as natural evil. At any rate, this issue of original sin ranks up there as one of the most controversial issues in all of theology, eh? I don't think so, JB, if one is going by percentages, that is. The doctrine is coherent, congruent, etc. There's really nothing better around to take its place, imo. Maybe the very crux is that not everyone buys into the premise of the hypothesis re: original justice and innocence? Some simply take the view: Be patient, God isn't finished with me yet! These two positions are not mutually exclusive; kind of seems like a "false dualism" fallacy to put it that way, which is why I've never gotten along very well with the process theology and Matt Fox crowd. Just why it's so problemmatic for some to affirm an early innocence that was violated by a deliberate act of wrongdoing is beyond me. My past experience working in the field of chemical dependency has helped me to appreciate how dysfunctionality is propagated in families through many generations. I understand the doctrine of Fall/Original Sin to be affirming something similar. Somewhere, somehow, there was a beginning to the moral and spiritual dysfunctionality we find in the human family, and the doctrine provides a coherent explanation for such. Are you aware of a better one that doesn't posit the soul as an emergent development from matter itself (which would be an additional impediment for a Christian to embrace, and which would seemingly root evil in matter)? I guess in the end, my metaphysical focus is somewhat "constrained" by what I take to be the "givens" of revelation (which would include the Fall and its consequences, here). I'm not really interested in debating every possible explanation for the universe, the human being, evil, etc. This is not to say that some of them don't meet the criteria for "good explanation," only that I find that, somewhere along the line, some essential aspect of revelation seems to get compromised. Well, if someone accused you of substantialism or essentialism, which they might, when reading this (quote from this session), I'd tell them to read the earlier session on human nature, especially points #2, 3, 5, 7, 8 and 9 under the "Metaphysical notes" section. My presentation, here, comes in the context of earlier ones. I've just skimmed through your recent post and will have to get back to you on it later. It seems I may have replied above, however, in my point about the constraints within which I write. Oh . . . if my thinking sounds a lot like Arraj's, it's not simply because I've read him, but because we've both been formed within the same tradition of thinkers and writers. One of the reasons we became close friends is because, when we began corresponding some 20 years ago, we discovered how much we held in common. To all interested . . .
Could we refocus and try dialoguing about the session I actually presented? What specifically do you find helpful? Problemmatic? And for the latter, please put it in your own words, and state why that is so. What makes sense? What doesn't? Why? No wrong answers to those questions, and no requirement of theological expertise to state them. If, in addition, you want to engage in some of the exchanges already underway, that's fine. But don't feel as though you're somehow required to first sort through all of that to contribute. Just jump in anywhere that you wish. JB, that's a very fine post above and a good "crash course" in some of the philosophical issues at stake, here. Thank you for taking the time to write it. I do see the relevance to the topics being discussed in this series, only it's difficult sometime to know just where to begin to respond. I don't approach things with all the categorical "isms" in mind to avoid or indulge, but just try to express my understanding. Maybe you could suggest a specific issue? I was looking all over for that! The reason for the question is because classical teaching regarding original sin indicates that we inherited not only moral-spiritual dysfunctionality, but thoroughgoing mortality. In plain words, physical death. So "the Fall" transmitted not only death of the soul but also death of the body. I never really viewed the existence of evil, itself, be it physical, metaphysical or moral to be in dispute. Even the moral theologians speak, too, of a pre-moral and ontic evil. Are you saying, then, that evil is just a bad choice of words and should be reserved only for moral agents? Evil is conventionally viewed as a privation of good and not merely the result of culpability. So, I prefer the word finite (limited forms) to describe what is classically called metaphysical evil. Physical evil, too, is not intrinsically evil, proceeding as it does from God as a punishment for sin, a form of justice, which is therefore really a good. That leaves, really, as I think you are saying, only moral evil, which is another word for sin. So, thinking this all through, I guess the thrust of my inquiry was whether or not The Fall had anything whatsoever to do with what we call natural catastrophes in the natural order, nature taken its course, as you say, which is basically good. I am supposing the logical extrapolation would be that the cosmos would have evolved as it has, tornadoes, hurricanes, volcanoes, earthquakes, heat death of the universe and all but that, absent a wounded human nature, none of that would ever harm us or punish us. Just wondering what the teaching is as a matter of curiosity. Any thoughts? RE:At any rate, this issue of original sin ranks up there as one of the most controversial issues in all of theology, eh? What percentages? Sociological? That's the context for my question. I may have hung around the thoroughgoing secularists too much, but does anyone else get the distinct impression that not only is original sin widely in dispute but the very concept of sin itself has been on the wane in the vein of "What ever happened to sin?" But we might have also heard the distant rumblings and roarings of heavy equipment as theologians after the Second Vatican Council attempted to dismantle the traditional formulation of original sin, or have read something about their work that shows it to be far distant from what we had been accustomed to. Therefore the question remains today in all its actuality, "Whatever happened to original sin?" The average Joe, I suppose, would not be able to disambiguate the term sin, which is a moral evil, and original sin, which is only a sin by analogy. But even if we changed the terminology to better convey this reality, the substantive issue is our sense of justice and someone being punished for someone else's crime. I think the classical answer to this is that there are two types of punishment: penal versus medicinal. The former is adminstered due to culpability and as justice, the latter as divine therapy, in service of the soul, ergo a good and not a privation. So, maybe the word punishment needs disambiguation, too, or a substitute found. But that is not the only challenge I am talking about --- there is that from the theologians and academics, too, which Jim mentioned. But regarding the doctrine as having nothing better to take its place, are you referring to the rupture, the woundedness, in and of itself, as being "the doctrine" --- or are you, rather, referring to the thomistic account of the Fall (ontological rupture) versus, let's say, the process account, the teilhardian take (teleological rupture) versus even the Gelpian account (semiotic, triadic experience)? 2) the dismantling by theologians of the idea in and of itself and 3) the metaphysical angles. My main thrust, so as not to be misunderstood, pursuant to the nature of this particular forum, is the metaphysical angle, which is not really doctrinal or creedal. In that regard, my position has been that there is no reason to set the accounts of the thomists, process folks and triadic-semiotic over against one another. Like breaches in levees, these ruptures could be from any number of causes, imo, without doing harm to dogma. RE: Maybe the very crux is that not everyone buys into the premise of the hypothesis re: original justice and innocence? Some simply take the view: Be patient, God isn't finished with me yet! Well, see my above comment. I concur. Neither do I view the different metaphysical accounts as mutually exclusive (note my past discussions about cosmological, teleological, ontological, axiological and epistemological ruptures). So, I agree with you. At the same time, another way of engaging the challenge would be to say, even though not mutually exclusive, for whatever reason, the alternate account is so much more compelling and robust so as to render the other account unnecessary, eliminated by Occam's Razor and not rather by the invocation of some fallacy of formal argument. My past experience working in the field of chemical dependency has helped me to appreciate how dysfunctionality is propagated in families through many generations. I understand the doctrine of Fall/Original Sin to be affirming something similar. Yes. The butterfly effect of sin (and mistakes/finitude)on both our contemporaries and our progeny. Somewhere, somehow, there was a beginning to the moral and spiritual dysfunctionality we find in the human family, and the doctrine provides a coherent explanation for such. I think the myth of the Fall primarily conveys and affirms the truth that there is something missing, something wrong ... but gives us neither a physical nor metaphysical account of why. That we need help is a salient issue. That is the allegorical-creedal dogma I take from the Fall myth. That help has arrived is central. That is the dogma I take from the NT. There have been various efforts to understand the reasons for the myth of Eden - it could even lie so deep in the human unconscious as to reflect the retreat of the forest which forced the most primitive proto-hominids to exercise what ingenuity they could out on the African savannah. But there is no evidence that hominids were ever in an idyllic, predation-free relationship with the non-human creation.The importance of the Fall story must be that it describes that peculiar sense of alienation that seems to characterise the life at least of technological humans, a sense that we cannot wholly settle in our ecological niche or network of relationships, a sense that we yearn for something other but cannot grasp it. The need to move away from the historical Fall has been strongly emphasised by the scientist-theologians. Peacocke takes the argument in a helpful direction when, drawing on his idea that relationship with God and right perception of our environment represent the highest-level ‘emergent’ in the biological hierarchy, he argues that humans’ ecological niche includes a right relationship with God, which for all sorts of reasons - some genetic, some cultural, some as mysterious as the appearance of evil in Gen.3 - continues to elude us. Are you aware of a better one that doesn't posit the soul as an emergent development from matter itself (which would be an additional impediment for a Christian to embrace, and which would seemingly root evil in matter)? Whether the soul is emergent from matter is a metaphysical issue and not an essential dogma. For that matter, pun intended , matter refers to substance ontology, which, as we have discussed previously, is not the only game in town. No matter, no rooting of evil therein. Besides, think of your Helminiak heirachy of the positivistic, philosophic, theistic and theotic. And recall how they interact without the higher realms interfering with the lower but, as I like to say, dealing instead with progressively larger foci of concern. It seems to me that both the theistic and theotic are trespassing on the positivistic in some interpretations of the Fall myth. There is nothing in biological or anthropological science that would support the notion that Homo sapiens wouldn't have been the prey of other creatures. Well, as I already said, there are some dogmatic truths, essential revelation, to be taken from the Fall myth. They don't include metaphysical accounts, in my view. This is not to say that our metaphysics and philosophy are not informed by our theology -- only to suggest that theology informs them from an evaluative and not, rather, a positivistic perspective. Even the secular humanists affirm a free will in our species, which, cognitively, is very likely an open-ended processor. To the extent that processor emerged from matter and largely constitutes the most novel aspects of our many rationalities, with us as embodied and detemined on one hand, but autopoetic (self-organizing) and free, otoh, we became, as Phil Hefner says, created co-creators. It doesn't take some divine intervention to explain human rationality any more than it takes intelligent design to explain so-called irreducible complexity. Such arguments are deeply analogous (if not even substantively the same to a degree). It only takes THAT things are and NOT HOW things are in conjunction with creatio continuua to instill mysterium tremendem et fascinans in me. For all I know, and it wouldn't matter as much as some other things, Intelligent Design folks could be right. However, that "science" presently is too speculative and scholastic notation would consider it improbable, presently, from a positivistic perspective. As long as we can affirm free will, even in an emergentistic paradigm, evil remains the product of autonomous moral agents, whether they are conceived in a substance or process metaphysic or semiotic-social-experience grammar. The whole point of emergentism is the emergence of novelty, unpredictable novelty. And a nonreductive physicalism doesn't reduce human rationality to mechanistic, deterministic "stuff" that has to be intrinsically evil, somehow making the emergent moral agent exculpable. RE: Well, if someone accused you of substantialism or essentialism, which they might, when reading this[/i] (quote from this session), I'd tell them to read the earlier session on human nature, especially points #2, 3, 5, 7, 8 and 9 under the "Metaphysical notes" section. My presentation, here, comes in the context of earlier ones. Like I said, probably in a deleted post, all metaphysics are pregnant with paradox, fatally flawed. Our quest is to find the one that will not result in multiple birthing, that is the least morbid. The thomistic analogy of being, even modified by process-like dynamic, formal fields, as a substance ontology with an analogy of being, will not elude the causal disjunction paradox I already set forth. But that is the one I choose to slay me because --- self-evident or not, empirical or not --- common sense notions of causality have always been REALLY good inferences, even when they couldn't be empirically demonstrated or formally proven. They rank right up there, in that regard, with the first principles (noncontradiction, excluded middle and identity). I do not claim explanatory adequacy and do not deny the tautological nature of any of my views -- substance, process or semiotic. I do think they all serve us in our inexorable but always fallible advance on knowledge: positivistic, philosophic, metaphysical, theistic and theotic. Well, I hope I have not in anyone's view digressed in this thread. All of these things I have contributed are foundational to any architectonic and theological anthropology. It is futile to argue about conclusions if we can, rather, locate disagreements in premises. It is idle to argue about premises if we have not disambiguated the terms we employ. That is the spirit of my contribution. Unity of mission and diversity of ministry is a wonderful gift of our catholicity. As also is our freedom to choose philosphical and metaphysical systems, which cannot conflict with dogma, as if authentic ratio could ever be against authentic fides. Unity of mission AND ministry has to be very special indeed. In Oregon, I sensed, right away, a DEEP concordance in your and Jim's political philosophies. As I like to say: All contemplation ends in politics but not all politics begin with contemplation. JB, that's a very fine post above and a good "crash course" in some of the philosophical issues at stake, here. Thank you for taking the time to write it. It takes me a while to compose my treatises, so we keep cross-posting. But you are welcome. I promised to re-write my other "journal entry" back when I apologized ahead of time for its density and inaccessibility. Then, notwithstanding my apologetic note you took all of MY points and reiterated them in a follow-up post? characterizing my post the same way I had already done --- a phenomenon often characterized as exhibiting one's grasp of the obvious. In experiencing my own little sufferings I have come to see that Christ is in the midst of them, somehow there can be found great beauty there, though these suffering swould seem to be the result of evil. But I appreciate discussions of evil, indeed, great evil exists, and the only way I've figured out how to deal with it is to confront it in myself, and it's all there. I usually end up saying to myself that I don't know how it happened, I don't know nothin', but here we are, such as we are, God have mercy. Somehow I feel that if I could understand it better, my belief would be stronger, but I always end up more confused! A lot of what we have been discussing has been debated for centuries, ore-dating Christ, even. One might suppose He would have bothered to provide us rational discourse in response to our theodicy issues. For example, why did this tower fall on those people? Why was this man born lame? Why did you let my brother, Lazarus, die? This is another clue, perhaps. He came. He suffered with us. He emptied Himelf of all Godly attributes that would have exempted Him from the punishments we experience. He healed. He forgave. He loved. He emphasized , right relationship, wo/man to wo/man, wo/man to God, wo/man to creation. He taught us what to value and how to order these values and rid ourselves of inordinacy and disorderedness. Our attraction to authentic beauty, when we see it, and our keen aesthetic judgment, is an integral part of human pragmatic rationality, a large part of the affectivity- leading with the heart, following with the head. My head tells me to make the sign of the Cross and beg for mercy, too, before it ever goes out to talk metaphysics with the good old boys of thomism and girls of carmel. Still, I would say we all strive for AMDG, ad majorem Dei gloriam, the greatest Glory of God, and that entails ongoing conversion, per Lonergan, affective and moral and social and religious and ... ... cognitive. And these all inform and transvalue one another. OK, if all entries are welcome, then I don't find much help in a left brain approach considering our present world. It feels like we are repeating the CHOICE that gives us more from the tree of knowledge and of good and evil. That hasn't been known to produce the best fruit. Perhaps this is OUR moment in the garden, and all the knowledge in the world isn't going to help us make a better choice. Why did God tell them to leave it alone? Perhaps God is still waiting for us to choose relationship instead of our wanting to be gods in control! Love is the energy that transforms what is destructive to life. How do we manifest it? What if we are in a sacrament of the present moment? If metaphysics is concerned with the fundamental nature of reality and being and is described as a study of what is outside objective experience, then it seems to me we are invited once again into the garden and into the challenge of manifesting love in our own hearts and to explore the ways that we might integrate that into our own reality. You are not mistaken in presenting what we know for review, but our deeper hope is that we might come together in some vision to somehow make a higher choice than our ancestors. We know how the story comes out, and yet the flaming sword still seems to be preventing us from finding our oneness with each other. I feel the longing for connection with so many other listening hearts, and we hope for something real that will bring us to life again. We have every evidence of the fall all around us and within us. We are reminded every day of the fragile nature of the planet. Are we doomed to repeat the mistakes through all the cycles of existence forever? How can we begin to bring a glimpse of heaven to our lives right here and now? Hmm . . . some frustrations, here. I will say that, ultimately, I am not interested in metaphysics for metaphysic's sake, nor do I have the same level of interest in philosophical precision about this topic that JB has introduced into the discussion (which is appropriate to do and appreciated -- by me, at least). My interest in metaphysics has always been in the context of spirituality, which means that my attempts at metaphysical explanation are in the interest of supporting spiritual growth. I do believe we've missed out on something during the past 30 years or so because of our negligence in teaching on this in the Church so that most Christians don't really have a very good grasp of what human nature is, how God and creation relate, and what we're saying has happened between God and the human race because of Christ. That's a need I'm trying to fill, here. I do think the Fall, however it is conceived, is an integral part of revelation. JB has pointed out some of the problems with the traditional explanation, some of which I'll try to respond to more fully. But I don't think we can, in the end, compromise on that aspect of doctrine. If there were a way to have this thread broken down into sub-threads, that would be great, as people could pursue the ones they wanted. Most of you have been around the Internet long enough to know that you can skip over posts that don't particularly engage you and respond to the ones that do. I encourage that, even though it might seem that we're talking "past" each other. That's OK.
1) We differ in that I do have an interest in metaphysics for metaphysics sake, so to speak, the theoretical science of it. Kind of a hobby that most people don't find too very engaging and which some positively eschew. No problem. 2) We are alike in sharing an interest in metaphysics as it informs our formative spiritualities and theological anthropologies, so to speak, the practical science of it. 3) I'd say that there is both a lot of confusion and controversy about how science and metaphysics interact with religion, in general, and certainly with biblical exegesis, in particular. The need Phil cites is very real. 4) Nothing wrong with leading with the heart! It is precisely because of our finitude that leading with the head doesn't work, Naomi. Even for those who might not agree with us about faith and "the heart" having primacy, they'd be in serious error to suggest that their own heads operate without their hearts' influence (iow, the evaluative). No one could seriously maintain that either operates autonomously. It would still be more accurate to describe the "choice" as re: our acknowledging with which faculty it is that we lead and not as a false dichotomy re: which faculty we are to use. Holistically and integrally, we employ all of our rationalities and affectivity. ... even though theology, as instanced by Aquinas and Rahner, has traditionally opened the systematic exposition of the Christian faith by an analysis of natural religious knowledge, this has never served to deny that the Christian faith is epistemologically prior.